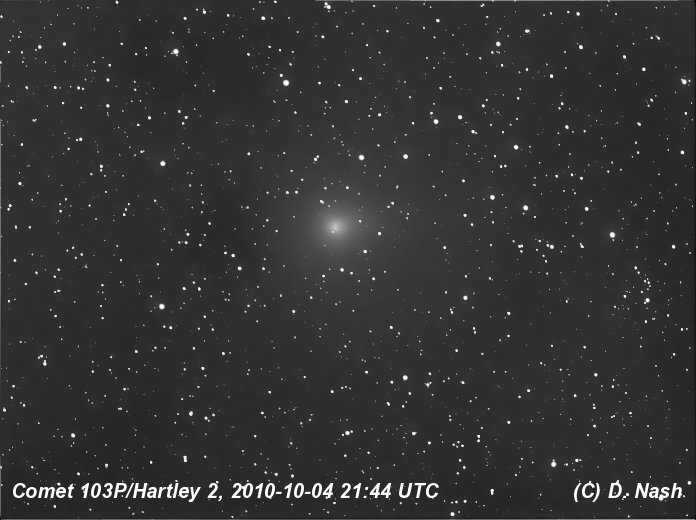 On 4 October I got my first view of a comet that's been raising hopes among amateur astronomers of seeing a brightish comet in our sky. I still haven't seen Comet 103P/Hartley2 in binoculars, but I saw it the other day through my Megrez 80 telescope and captured this image. This is a stack of 14x40second images, stacked using Deep Sky Stacker and processed using PixInsight LE. The night was humid and hazy and getting more hazy - I tried to capture some more images through colour filters but by then the humidity in the air had increased to the point that even brighter stars were looking like comets. 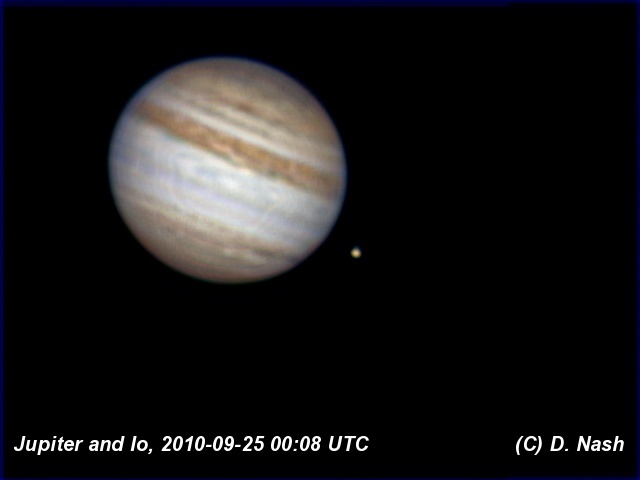 Io is of course one of the four Galilean moons of Jupiter. 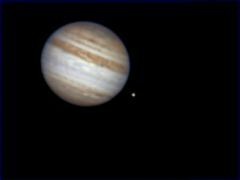 As these moons orbit the planet they from time to time pass by the planet leaving a shadow on the disk of Jupiter. These shadows can be easily seen from Earth. I imaged Jupiter using my TouCam Pro on the night of 24 September. 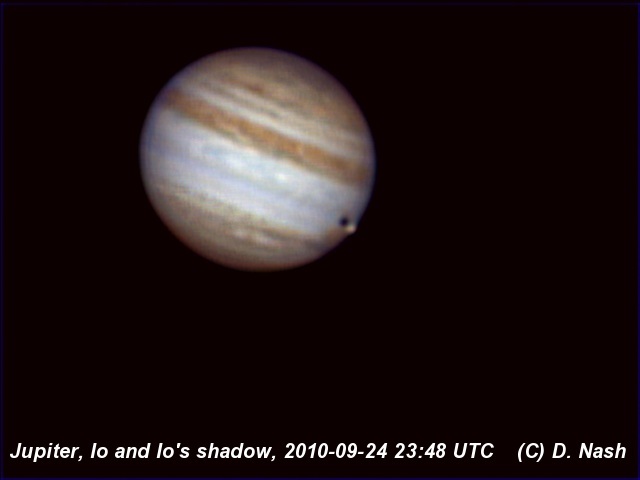 The first image (above) shows the shadow and Io itself. 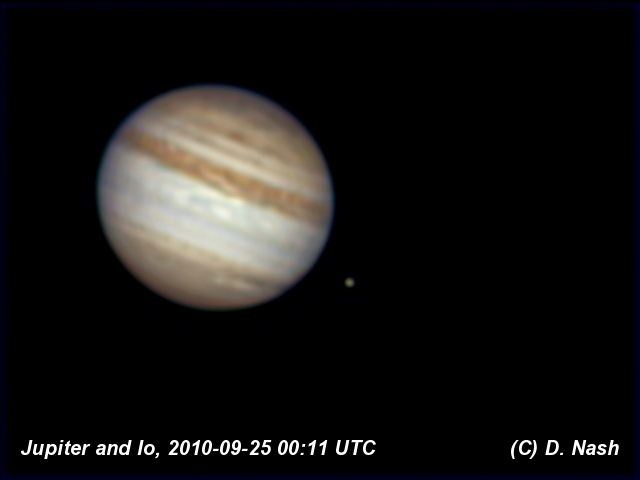 Here are a couple more images of Jupiter from the same night, with Io now having passed by - Eclipse over! These were all processed in Registax 5, with further tweaking in The Gimp. 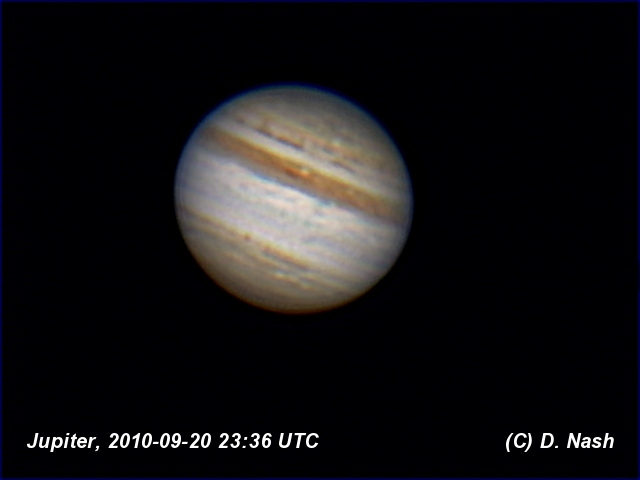 Here is an image of Jupiter I captured last night. The night was a little cloudy and I didn't expect great results. The image on my screen while capturing looked reasonable but very blurry. However after capturing 2000 frames and stacking 864 of them it turns out to be the best image of Jupiter I have ever taken. Click the picture to see it full-sized, or Here for an enlarged view. 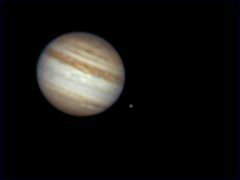 I have heard it said in the past that a little haze can be good for planetary imaging, now I believe it!